DNA tests set to be carried out on a bizarre corpse allegedly found in a back yard in Arizona. Todd Ray, who runs the Venice Beach Freakshow in California, said he was sent the being’s body by a mystery man who claimed it was laying in his back garden. Mr Ray said: “I got a call from a guy in Arizona who said he found the dead creature in his yard. He was expecting to be sent photographs, but, instead some weeks later, the extraordinary specimen turned up in a box in a jar soaking in alcohol. Mr Ray, who has the Guinness World Record for amassing the biggest collection of two-headed animals in the world, had no contact details on the package and is hoping the mystery finder will get in touch. Venice Beach Freakshow is a collection of bizarre and unusual discoveries under one roof. Mr Ray added: “The man told me it looked like it had gills under the head and that something was “growing out of it’s head like a flesh antennae. “This is the creature he told me about and it is stranger than I could have imagined. It is truly the most alien creature I have ever seen in my life. “It is a mystery to everyone who sees it in person. According to The Huffington Post, it contacted a number of zoology experts, who were unable to conclude what it was, with one suggesting it could have been put together from different animals. 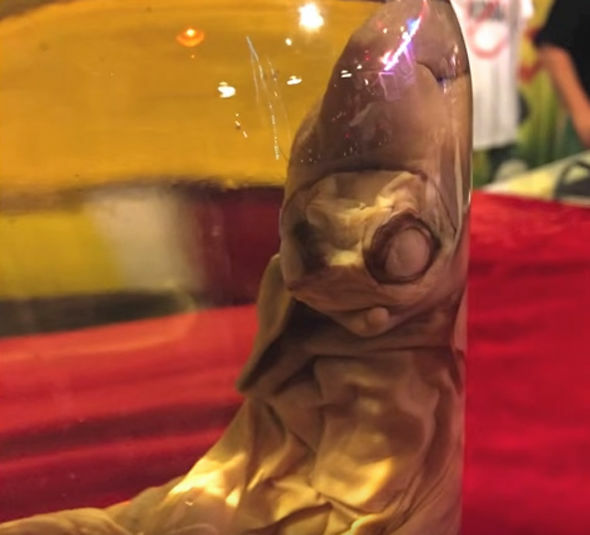 Cristina Simmons of the San Diego Zoo said in an email: “It could certainly be an aborted/malformed fetus of any number of species but it appears to be an amalgam of different tissues. The Arizona Game and Fish Department, could only conclude it was mammalian-like, possibly a squirrel, deformed pig fetus or fetal bear still in the amniotic sac. - Body of strange ‘alien’ creature found in a man’s back garden baffles experts ...but can YOU work out what it is? There are varieties of myths about creatures that are half goat-half human. The Greeks had satyrs, who hung around with Dionysus, the god of wine and fertility. The Romans had fauns, who had the torso of a human, but the legs, and horns, of a goat. The legend of fauns crept into contemporary pop culture through the character of Mr. Tumnus, from C.S. Lewis’ The Chronicles of Narnia. Now, one Malaysian farmer believes he might have found a real life hybrid. Ibrahim Basir could not believe his ears when a farmhand gave him a report on a newborn goat. 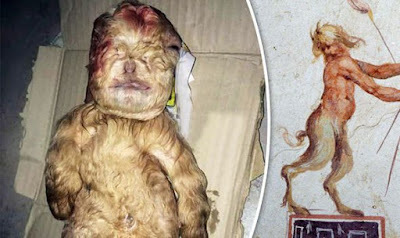 Basir, a 63-year-old farmer from southern Malaysia, rushed to the pen and was shocked to see the body of a kid (baby goat) that possessed the features of a human baby. In particular, the face had a distinctly human appearance because of the goat’s small nose, missing ears, and seemingly angelic smile. The animal also had short limbs and an underdeveloped torso. There were clearly hoofs on all four legs and a light brown coat of fur covering the body. By the time Ibrahim made it to the goat pen on his farm in the village of Felda, the newborn was dead. The mother had attacked the goat soon after birth and trampled it to death. Basir has never before seen a mother act with such hostility toward her own newborn. Further adding to the mystery, the farmer claims that the kid did not have an umbilical cord. Local residents fear that the newborn goat is a mutation and an omen of bad tidings for the community.